Remember the last time you carved a pumpkin for Halloween? Like when you were eight? That ugly jack-o-lantern? Yeah... that was sad. But guess what? It's time to totally redeem yourself! 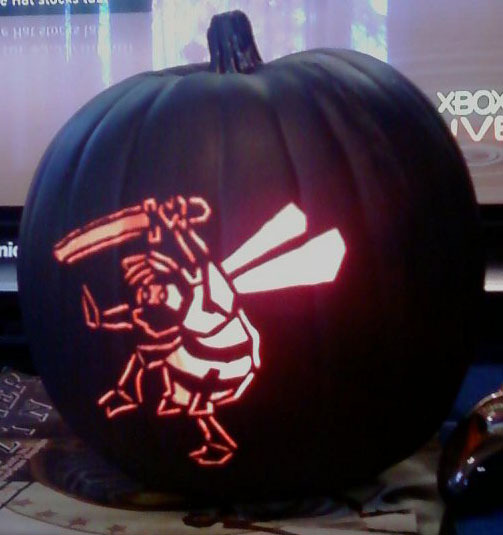 Do something frickin' awesome this year to decorate for Halloween by carving a NinjaBee pumpkin! Just save and print this pumpkin stencil and you're on your way to having the coolest jack-o-lantern ever carved! That special someone you like... they'll dig it. And you know what they say about NinjaBee pumpkins, right? They bring good fortune, wealth, good looks, fame and tact! Okay, well, technically we can't guarantee it will bring you any of those things. But if Halloween arrives and you haven't gotten that stuff, at least you'll have a sweet-lookin' pumpkin! Win-win! Special thanks to an awesome fan, Wolfiesden360, for creating this and sharing it with us! I actually had this idea last year, and I was going to do a similar design this year. Great job on the pattern and carving.